The phones have not been idle for the folks at Cruise America. More and more travelers are discovering the many benefits of renting or purchasing an RV for their travels. Low prices, cheaper gas and rising wages have boosted the RV travel industry substantially since 2016. First Time Renting an RV? Renting a motorhome is a great way to enjoy the RV lifestyle. If you haven’t tried traveling in an RV, your first experience will be a real treat! There are all kinds of resources that will tell you just what steps to take to rent and operate an RV, along with how to utilize all the amenities that it has to offer. However, there are not a lot of resources that explain a few of the things NOT to do. RV manufacturers anticipate shipping a record-breaking 446,000 recreational vehicles in 2017, up from last year’s 430,691, which was also a record. But what has instigated such growth? One of the activities that goes along with camping in the great outdoors, is photography. So many of our travelers are constantly showing us photographs of their trips, and we love it! That’s why we sponsor a photography contest from time to time … because we know that you’re going to take plenty of photos while on your RV adventure. This is the last chapter of the three-week adventure we titled "Sherman's March to the Sea. Please see our previous blog entries on the Cruise America blog page. Throughout Sherman’s March to the Sea, we’ve had some great stops along the way. Helen (adorable wife) and I both loved White Sands, NM, and Cottonwood, AZ, but we probably saved the best for last. Where Will You Be for the Big Show? Sherman, our Cruise America RV, pulled out of Kirtland AFB raring’ to go. We had rented a car for a couple of days to explore the area around Santa Fe, so Sherman was given the weekend off. Now, rested, ready, and with a full tank of gas, he was heading due west on I-40 to Cottonwood, AZ. It’s just a matter of days before the Great American Total Solar Eclipse will manifest itself as it makes its way across the nation—from coast to coast. On August 21, 2017, America will witness something that hasn’t been seen in over 100 years; a total eclipse of the sun that will travel the width of the United States, and will be visible from the Pacific to the Atlantic oceans. Where do You Stand Statistically? 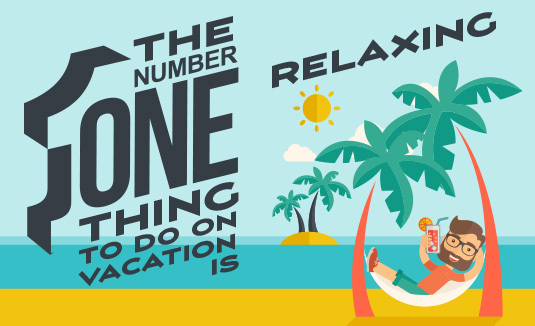 According to a survey conducted by The Associated press-NORC Center for Public Affairs Research, the number 1 thing that Americans want to do while on vacation is … nothing! In fact, close to 75% of Americans say that relaxing while on vacation is extremely important to them. They are perfectly willing to turn in their hiking shoes for a good, comfy hammock. What About the Traditional Staycation? We were on the eighth day of Sherman’s march to the sea and staying at the Kirtland AFB FamCamp. Our seventh day had been spent taking in the sights around Albuquerque (see previous post) and today, the eighth, would be devoted to Santa Fe and some shopping.